A well-considered feature set, allied to quick set-up and impressive flexibility, at a compelling price. Impressive array of I/O options. Included software bundle with sounds, sequencing and effects processing. Thunderbolt compatibility frees up USB port. 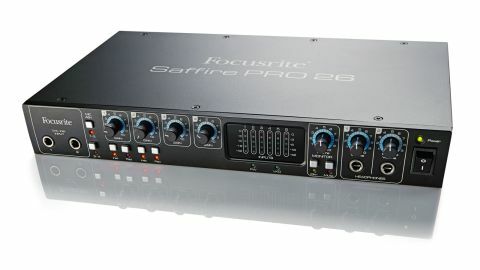 Focusrite's latest addition to its Saffire Pro range is the 26, whose number reflects the total input/output count it can accommodate, with an 8x8 configuration possible 'in the box' and a further ten inputs available via an ADAT connection. Add in buss power, Focusrite's high-quality preamps, up to 24-bit/96kHz recording, a 'version' of Thunderbolt compatibility and a bundled software suite and, for £299, there appears to be a lot to like. "The Pro 26 is just big enough, physically, to accept all of your connections without getting that cramped feeling"
The Pro 26 slots in between the Pro 24 and Pro 40, though its appearance owes more to its bigger brother, offering its control set via a box about 13in wide, making it the perfect companion for laptop set-ups. Its options are nicely arranged, with mostly appropriate choices for which connections are found at the front and rear of the unit. At the front, from left to right, you'll find Line/Instrument 1/4-inch inputs, whilst rotary dials to control gain for the four high-quality mic pres come next. These are surrounded by buttons to enable phantom power (with separate buttons for channels 1/2 and 3/4), toggle between Line and Instrument input sources and enable pads at the input stage. The centre of the front panel is occupied by ladder LEDs to show levels for all six analogue inputs, whilst monitoring level to your monitors is controlled via the rotary directly to the right of this, with useful Dim and Mute buttons. Finally, there are two headphone sends, with independent level controls, before the power button completes the front-panel line-up. Round the back are two dedicated XLR inputs for channels 1 and 2, whilst combi XLR/1/4-inch jack inputs are provided for inputs 3 and 4. Two 1/4-inch Line inputs provide the final analogue input combination, with six line outputs provided to suggest the Pro 26 has surround mix engineers in its sights. The Optical input provides ten channels of ADAT connectivity and will work seamlessly with products like Focusrite's OctoPre, if you're looking to shoehorn in plenty of additional high-quality recording channels. Whilst the Thunderbolt logo appears on the front of Pro 26's box, the computer connector offered is via Firewire 400; you'll need an adaptor cable to use Thunderbolt compatibility. MIDI In and Out is provided to forego the need for a separate MIDI interface however, whilst digital I/O is offered via S/PDIF connectors. "Every Pro 26 owner is given a code to download a further suite of plug-ins, including Ableton Live Lite"
If that all sounds neat and tidy, that's because Focusrite knows what it's doing with this range. They may not be the most beautiful interfaces in the world, but they work - and then some. The Pro 26 is just big enough, physically, to accept all of your connections without getting that cramped feeling that half-rack audio interfaces can provide, which definitely helps justify the Pro tag in the product name. Focusrite's Saffire MixControl software pushes that feeling further still, readily allowing you to see all channels at once, choose input types, configure headphone cue mixes and much more on top. And the software fun doesn't finish there - every Pro 26 owner is given a code to download a further suite of plug-ins, including Ableton Live Lite, a software version of Novation's BassStation synth and two Focusrite effects suites. These are Scarlett - providing EQ, Gating, Compression and Reverb - and Midnight, which offers more comprehensive Compression and EQ options. These help further sweeten what is already a very appealing package. Straddling the gap between the budget and top-end models in the Saffire range, we suspect the Pro 26 will attract plenty of admirers.